This example is one of the few bearing a seal as well as a signature. The seal, Rong, is part of the name the forger used. 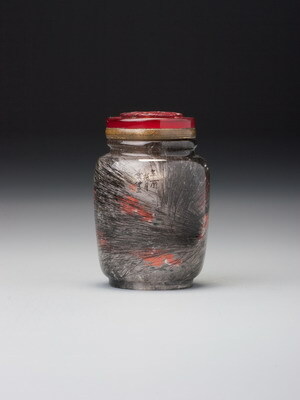 Although we do not have reliable details of the inscriptions on every recorded bottle, two others have seals (although both are Cheng, the family name, rather than Rong). One of them is dated to the sixth year of Shunzhi, the other to the ninth. 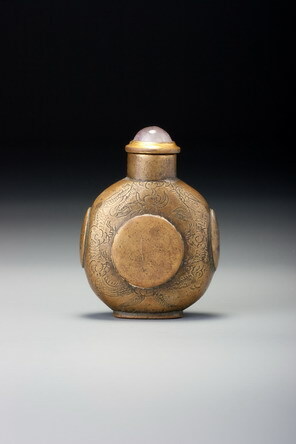 When of bronze, Cheng Rongzhang bottles are constructed of two moulded halves soldered together along the narrow sides. Many metal smiths in China who worked in bronze also produced copper wares, and as often as not they would beat the copper wares into shape from sheets of metal. At least two of the bottles from the Cheng Rongzhang group are in beaten copper.